We manage our customers' machining requirements with care to build trust. Penta has developed a system that enables us to deliver quality parts to our customers; ensuring the same level of service to all, irrespective of location. We use modern CNC machines, quick set tooling and fixtures, and utilise the latest technologies to ensure our processes and service exceed industry standard. Our ability to produce high tolerance, complex parts at competitive prices offers our customers the best possible value for money. Explore our Services, see the broad range of Market Sectors we serve or Contact Us today to discuss your requirements further with no obligation. Penta has come a long way since it was founded in 1998 by 5 people (hence the name Penta). We started out manufacturing tooling for an international computer manufacturer before developing our skills to encompass the aerospace, marine and fabrication industries amongst others. In 2007 we doubled our capacity, moved to larger premises and subsequently implemented an ERP system, resulting in improved traceability and archiving facilities. Soon after, Penta gained ship to stock status with a major aerospace customer, having attained a 99% quality performance for 2 years, and has maintained this standard since. 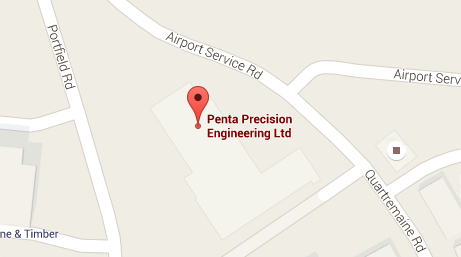 Penta is currently looking to expand further and invest in new premises, machinery and people to continue to increase capacity and broaden our range of services. We machine a range of materials in various grades, from aerospace to commercial. ABS (Acrylonitrile Butadiene Styrene), Acetal, Acrylic, Arlon, Delrin, Nylatron, Nylon, Nylube, PEEK (Polyehteretherketone), PEI (Polyether imide), Perspex, Polycarbonate, Polyester (PET), Ertalyte, Polyethylene (PE, UHMWPE, HDPE, LDPE), PI (Polyimide), Vespel, PPS (polyphenylene sulphide), Polypropylene, PSU (polysulfone), PTFE (polytetrafluoroethylene), Teflon, POM (Polyoxymethylene), PVC (Polyvinyl chloride) and glass filled variants. The most common plastics we machine can be found in our guide to plastic, where you can find common uses, technical properties and available stock sizes. If the component you require is outside our machining limits, give us a call and we may be able to help you source an alternative supplier. All external processes are subject to Penta’s rigorous quality procedures, going through a full inspection before dispatch to our customers. Explore our Market Sectors or Our Expertise to see how we help Design Engineers and Buyers with our efficient and reliable service.